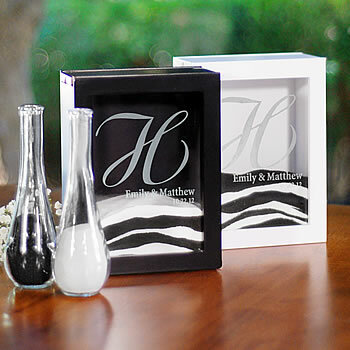 The Sand Ceremony Shadow Box may be engraved with a single script initial, two first names (max of 12 characters per name) and numeric date at No Additional Cost. *Please view "See More Photos" for single initial font chart. I really liked the box and it came in the allotted time. Just make sure you check your spam. The email with my confirmation number went to my spam number and I was nervous that the order never got placed. This box looked beautiful at my wedding. Thanks!! Arrived very promptly. Very nice quality. Simple and elegant. Highly reccomend! We have not married yet but we did receive our shadow box. I could not be more thrilled with the way it came out. Thank you for your great product and quick service. This product came just as described and looks great. I am very happy with this order. Thanks! The Unity Sand box really is great, I love how it is enclosed at the top so you don't have to worry about it spilling like normal vases. Also, they said they would be out of stock until a certain day which made me nervous but it got to me the next day! I would highly recommend this unity sand set by nice price favors. I am so happy with the way that this turned out!! Can't wait to use it! !